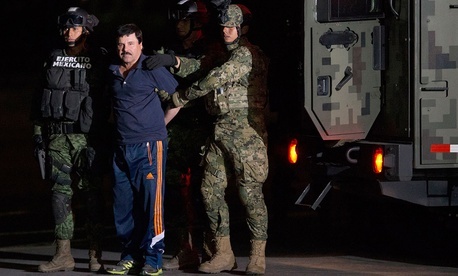 Mexican Judge Rules 'El Chapo' Can Be Extradited to the U.S.
Five months after capturing Joaquín “El Chapo” Guzmán, Mexican authorities have agreed to hand the infamous drug-cartel leader over to the US. The Mexican government on Friday granted extradition requests for Guzmán to be processed by federal courts in the Western District of Texas and the Southern District of California. He has been charged with a slew of crimes in both states, including organized crime, homicide, and money laundering. But Mexico’s green light doesn’t mean El Chapo, who was recently transferred (link in Spanish) from a high-security prison in central Mexico to a detention facility in Juárez, will be shipped to the US immediately. His lawyer told CNN he plans to appeal the decision. The extradition process can take years for a variety of reasons, including due process rules to protect defendants and the lack of political will by authorities. But Mexico may be keen to get Guzmán off their hands; he has twice escaped from Mexican prison, most recently using an elaborate tunnel and a motorcycle. The US has agreed that Guzmán won’t be subject to the death penalty, which is banned in Mexico. He faces charges in several US prosecutorial districts, but if the extradition goes through, his case is expected to be transferred to the office of the US attorney for the Eastern District of New York in Brooklyn. That office’s case against him is thought to be strongest.